Award winning online sitcom, The Guild, enters its third season with the launch of “Do You Want to Date My Avatar?”, a music video featuring the entire cast of The Guild dressed up as their own online “avatar” characters from the web series. The music video, released online, has been a runaway success, leading to 3,872,191 views on YouTube, becoming number one Music Video on iTunes, and number one mp3 download on Amazon. 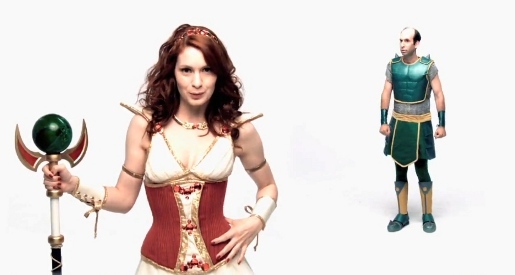 Felicia Day (Codex/Cyd Sherman), dresses up with the rest of the cast to become a star hotter than reality by far. Her electropop singing is enhanced by rappers Jeff Lewis (Vork/Herman Holden) and Sandeep Parikh (Zaboo/Sujan Balakrishnan Goldberg). Vincent Caso (Bladezz/Simon) flirts with the girls, while Robin Thorsen (Clara) casts her spells. Amy Okuda (Tinkerballa) provides the choreography. The video can be viewed or downloaded at MSN Video and XBox Live. The Guild is an award-winning online sitcom about the lives of an online guild “The Knights of Good”, with each webisode 3–7 minutes long. It is broadcast on The Guild’s official website, on iTunes as a podcast, effinfunny.com and YouTube, and is available for download from the Xbox Live Marketplace. The show follows the life of Codex, the healer of The Knights of Good, who attempts to lead a normal life after one of her guildmates shows up on her doorstep. The show started in the late summer of 2007, and for the first season was financed solely by Paypal donations from loyal fans. Since season 2, The Guild has been distributed by Xbox Live and Microsoft and sponsored by Sprint.